Born in Colorado Springs in 1902, Ruth Cave began her notable career in unpromising circumstances. Her parents were divorced before she was born, and her mother died when she was 11, leaving Ruth and her sister Dorothy in the care of her 60 year old grandmother, Minnesota Waters in Cripple Creek, Colorado. Ruth, her sister and her grandmother lived and worked in Boulder Colorado from 1917 to 1924. In 1924, Ruth Cave became one of the first African American women to graduate from the University of Colorado. However, discrimination prevented her from finding a position in the West, and she was forced to leave Boulder for the segregated South to find a teaching job. She taught French and Latin at Claflin College in South Carolina from 1924-28, returning to Boulder in 1929-30 to care for her grandmother and get an M.A. from the University of Colorado in French and Education. She then moved to Washington, D.C. and taught at Dunbar High School from 1931 to 1945. 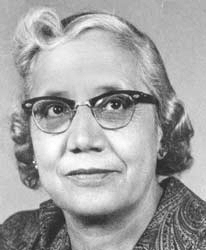 While there she attended Robert F. Terrell Law School at night and received her law degree in 1945. In 1937, Ruth Cave married fellow law student, Harold Flowers with whom she later practiced law and had a son. They were divorced in 1949. Two years later she received a Ph.D. in foreign languages and literatures from Catholic University of America in Washington in 1951. From 1951 to 1959, Dr. Flowers was Associate Professor of Spanish at North Carolina College in Durham. In 1959 she and her son Harold returned to Boulder to live, and she was hired as the head of the foreign languages department at Fairview High School, a position that she held until her retirement in 1967. Ruth Cave Flowers died in Boulder in 1980 at the age of 77. Susan Armitage, “The Mountains Were Free and We Loved Them,” in Quintard Taylor and Shirley Ann Wilson Moore, eds., African American Women Confront the West (Norman: University of Oklahoma Press, 2002).